Virginia attorney general’s race: How Democrats could win. How Democrats may win the Virginia attorney general’s race. 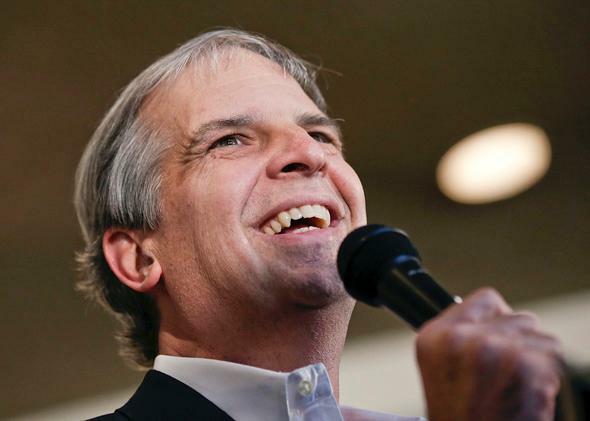 Mark Obenshain, the Republican candidate for attorney general of Virginia, is in a razor-thin vote-counting battle with Democrat Mark Herring. The race for Virginia’s attorney general is about as close as it gets in a statewide race: At the moment, about 100 votes separate the two candidates out of 2.2 million votes cast. When I started writing this article, Republican Mark Obenshain was leading Democrat Mark Herring, but that’s now reversed. County election boards are checking their math and deciding which provisional ballots to count. It is anyone’s guess who will be ahead when certification comes Tuesday night. In the meantime, Democrats are up in arms over what they see as a new rule the Republican-dominated state elections board put in place last Friday to make it harder to count provisional ballots in Democrat-leaning Fairfax County. Unless Herring builds up a larger lead, Democrats’ best hope for winning the attorney general’s race probably lies in federal court, and the results there are uncertain and may take a very long time to work out. Any time a race is this close you can expect partisans and political junkies to study every discretionary decision about which votes to count and how decisions get made, a process that has only intensified through crowdsourcing of election results on Twitter. The big fight this time around is over the rules for counting provisional ballots—ballots not counted on Election Day because there was some issue with them. For example, a military voter who had an absentee ballot sent overseas might have returned home before it arrived and tried to cast an in-person ballot at the precinct. In that case, election officials need to make sure the absentee ballot was never counted. Last Friday, after most of the counties had finished going through their provisional ballots but while Fairfax County still had a fair amount of work to do, the state Board of Elections issued a directive telling Fairfax County and the rest of the state boards that they cannot have legal representatives (or party lawyers) stand in for voters to advocate that certain votes be counted. Fairfax County said its representatives had been allowed to do so in the past. The state board, which has two Republican members and one Democratic member, said it issued its clarification on the legal advice of the attorney general’s office in an effort to assure uniformity. From that point on, voters would have to argue for themselves that their provisional ballots deserved counting. Democrats cried foul, noting that the rule change emanated from failed Republican gubernatorial candidate Ken Cuccinelli’s office and came after the other counties were done counting, while Herring was closing the gap. Fairfax County—it should be noted—tends to skew Democrat. It looked like a rule change midstream, intended to benefit Obenshain, the Republican. Monday, however, the Virginia Board of Elections issued a further clarification, stating that Fairfax was the only county with this supposed policy (allowing outside advocates to argue for provisional ballots) and that it would be unfair for Fairfax to use this different rule. The board further clarified Monday that a voter would not need to show up in person but could supply any missing information by email or fax. As with any fog of war, it is very difficult in the midst of a ballot-counting battle to know what exactly is going on. We don’t know how provisional ballots were treated in other counties, and we don’t know whether the Fairfax provisional ballots that may not be counted today will be enough to affect the outcome of the election. We don’t know what will turn up in other counties, like a just-reported tape of voting results that was apparently missed the first time through in Richmond, giving Herring the lead, at least temporarily. But we do know enough already to see what is likely to happen after someone is certified the winner in this race. The losing candidate may ask for a recount, and that recount may change some vote totals (though it almost certainly won’t in those parts of the states using electronic voting machines, which aren’t subject to a meaningful recount). So that could leave Democrats with the sole option of going to federal court to complain about the vote counting rules, especially those involving provisional ballots. There are actually two conflicting constitutional claims potentially at play: First, some read the Supreme Court’s controversial opinion in Bush v. Gore (which ended the 2000 presidential election in favor of George W. Bush) as requiring uniformity in how votes are counted across a state. If some counties allowed representatives to stand in for voters in the counting of provisional ballots and others did not, that might be a Bush v. Gore equal protection violation. Second, some courts have held that the Due Process Clause of the 14th Amendment bars a state from changing the rules for vote counting after an election has taken place; doing so always raises the possibility the rules are being changed to affect the outcome, and changes upset the settled expectations of the parties. If indeed Fairfax County had an established policy to allow legal representatives to stand in for voters in the counting of provisional ballots, then the new rule announced on Friday by the state Board of Elections could be considered a change in the law. But maybe not: If Fairfax were a rogue county and its rules violated state law, perhaps that should not count as an old law that has to be followed to comply with due process. And note how the two constitutional rules can conflict: If the state had an established policy that was non-uniform, what to do? If this seems convoluted, messy, and uncertain, you are right. A few years ago in Ohio, a dispute over provisional ballots in a judicial election for juvenile court took years and lots of money to resolve. The parties fought to get some clarification on aspects of the laws related to provisional ballots. That clarification is going to be needed even more going forward. In a new, important law review article, professor Edward Foley, director of the Election Law @ Moritz program at the Ohio State University College of Law, notes what he calls the “big blue shift”: In the past, post-election vote canvasses used to break about evenly for Democrats and Republicans. These days, however, post-election canvasses tend to favor Democrats because, for various reasons, Democrats are more likely to cast ballots not counted on Election Day. If Foley’s right about that, expect Republicans to favor rules making it harder to count ballots during the canvass, and Democrats to favor rules making it easier to count ballots. At stake then in a possible federal court fight between Herring and Obenshain over the rules for counting provisional ballots is the outcome of other, more important races, such as a possible 2016 Hillary Clinton–Chris Christie presidential contest.